On my recent trip to Barcelona, I stopped in the city for two nights before heading to Costa Brava for TBEX Europe 2015. 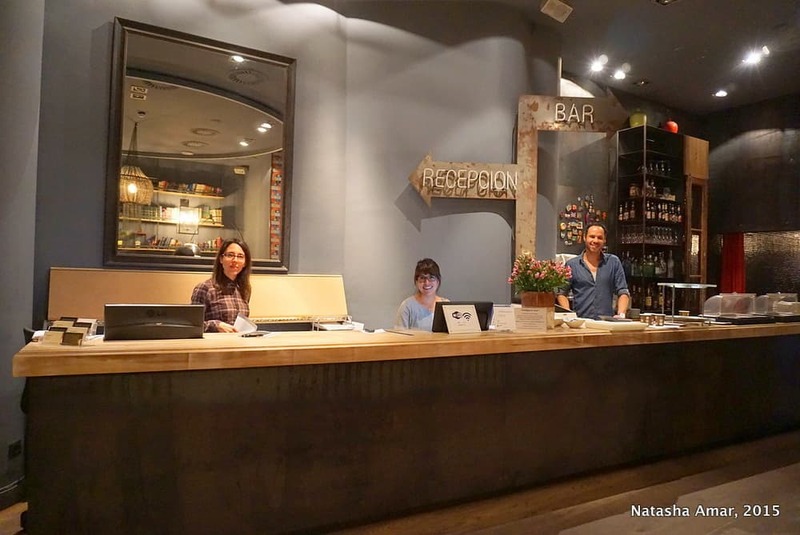 While looking for accommodation options, I knew I wanted to stay in an area that wasn’t on the touristic Las Ramblas strip but at the same time wasn’t too far away from the places that would be of interest to a first time visitor to the city. As my taxi dropped me off on the quiet shaded street in Born outside the chic&basic hotel, I knew I’d made the right choice. The location of chic&basic Born was great. The street outside the hotel has a few tapas bars and doesn’t get too noisy at night. There’s nothing to get in the way of a good night’s sleep and there’s also a supermarket close to the hotel. Born is known to be one of the trendy cultural neighborhoods in the city and I could see why. 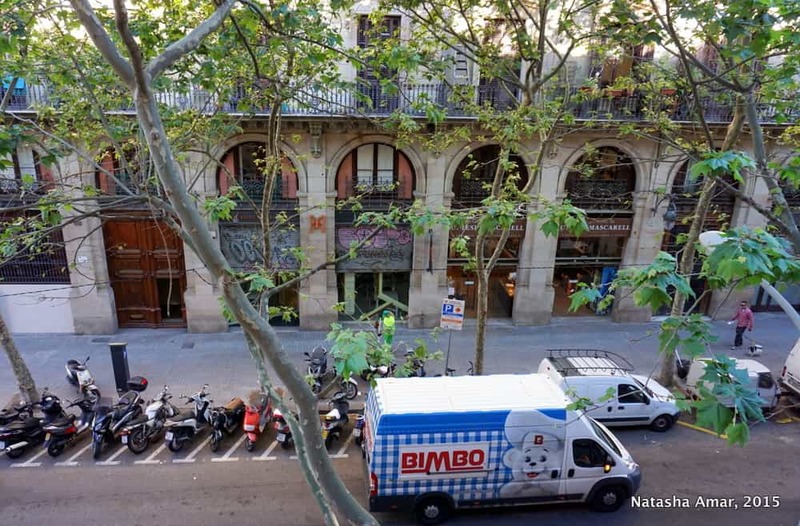 The area is home to the Picasso Museum, the Santa Maria del Mar Church, interesting boutiques and nice bars and pubs. 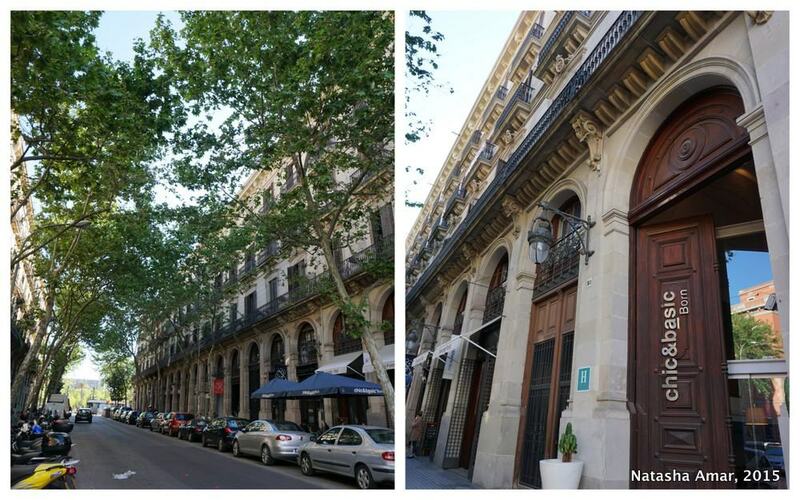 Jaume I is the closest metro station, a few minutes’ walk away. I also walked to areas such as Barri Gotic (Gothic Quarter), Placa Catalunya, the Barcelona Cathedral, Arc de Triomf and other areas. The city is well connected by metro so it was really easy to get around. From the moment I stepped into the chic&basic, I couldn’t help but notice how chic and edgy the décor really was. The chic&basic does not look like your average hotel; in fact it’s quite the opposite. 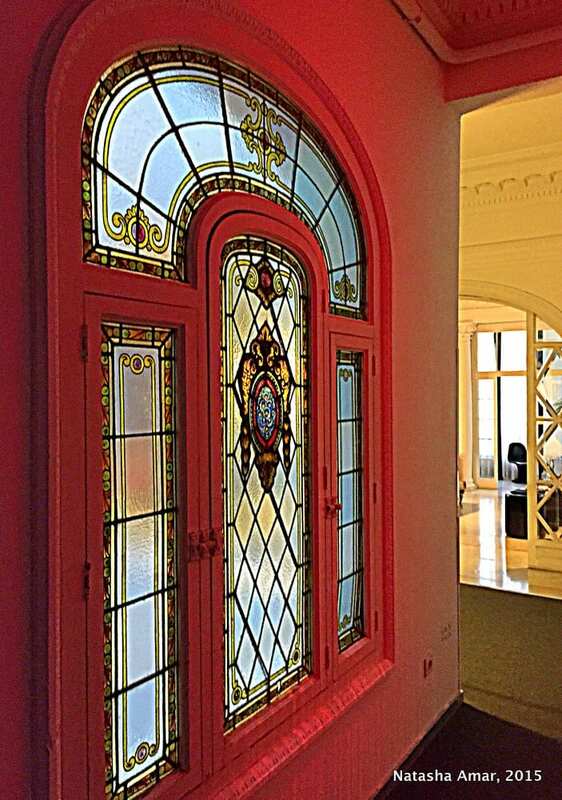 The building is over 100 years old but when you step inside, it’s like entering a futuristic design space. 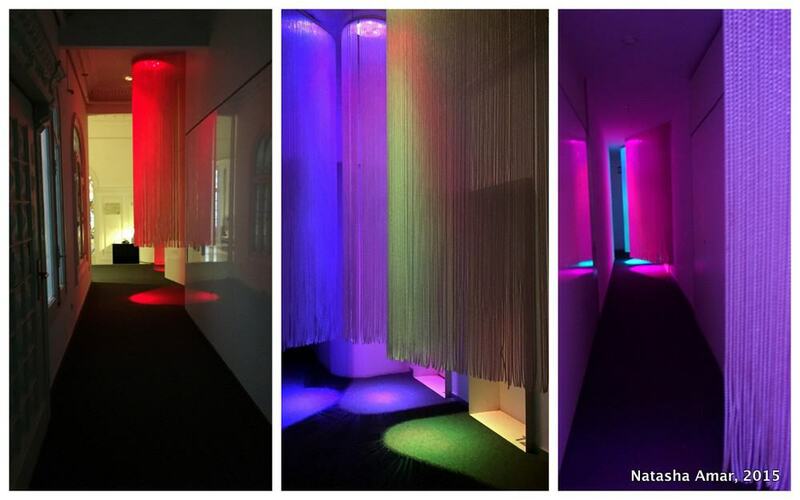 I’ve never seen a hotel corridor that looks like this! 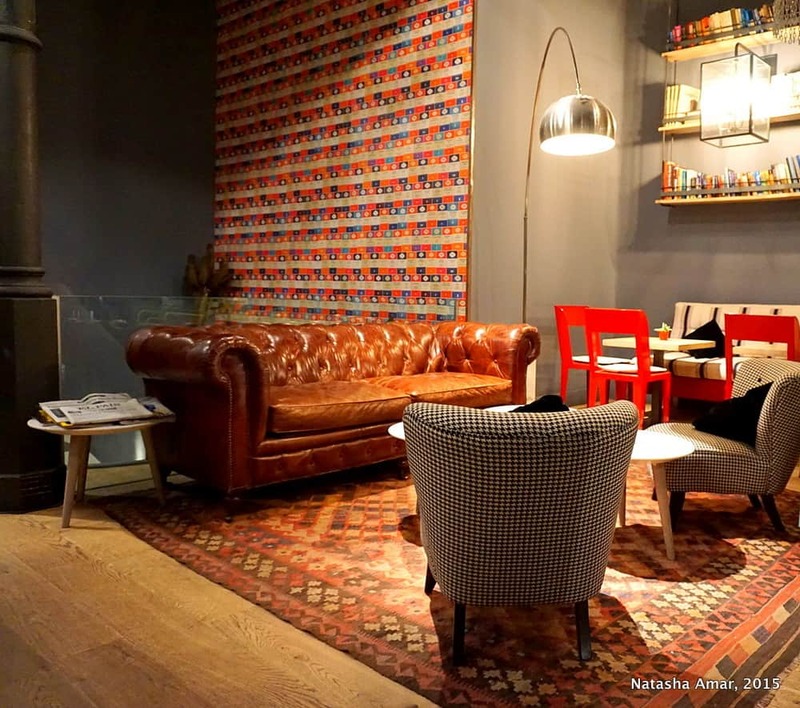 With its cool multi-hued lighting and glass-beaded curtains in the corridors and rooms, cozy common spaces and a tastefully decorated café and bar, the hotel makes quite the impression with its design. 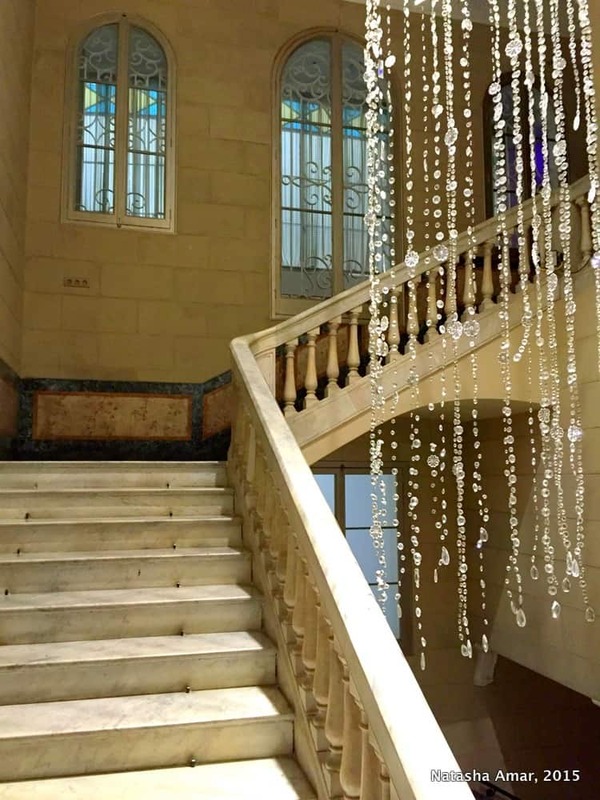 There is an air of mystery as you brush aside the curtains and walk through the corridors where the lighting changes depending upon the lighting in the rooms. 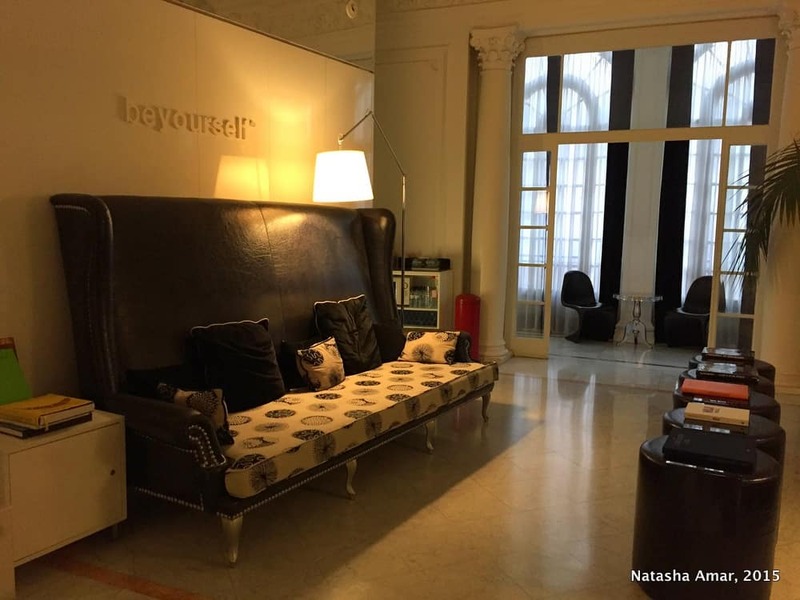 Their common areas ‘Be Yourself’ and ‘Help Yourself’ were a good spot to unwind, work, catch up on emails or read. The hotel was full of surprises and nice elegant touches. 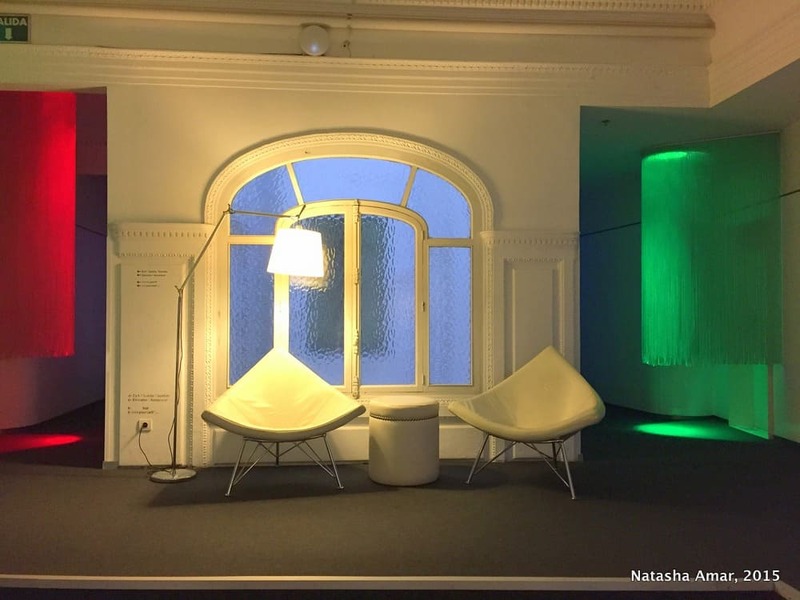 It was the first time I’d stayed in a hotel where the concept was about design that you create; think all white interiors (everything from the furniture to the walls) that change every hour or every day, depending on your mood and furniture that can be used and placed in different ways to suit your comfort. I loved this concept of being able to create the kind of space I wanted and have the best of creativity and functionality to suit my style. 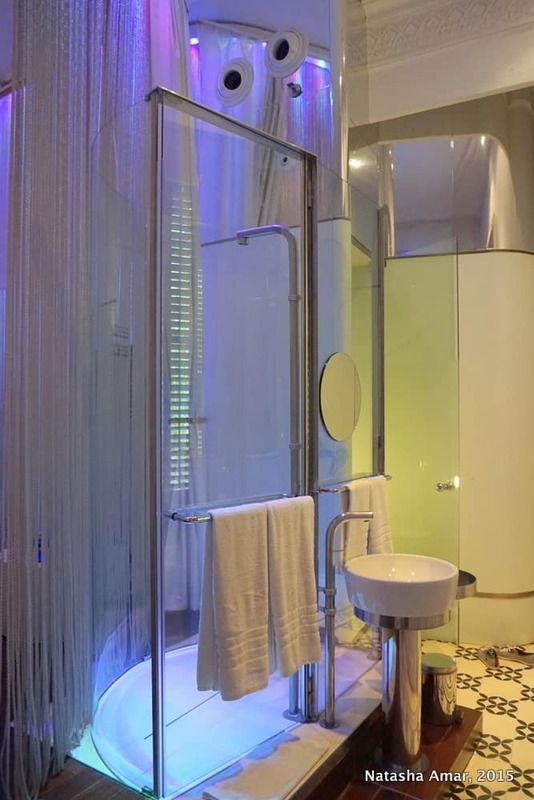 My room (Double standard with balcony) had a glass shower in the center of the room and an en-suite toilet, yet another example of cool and quirky design. My balcony looked over the leafy street outside. Check out the fancy lighting! The staff at chic&basic Born was incredibly helpful with providing information and recommendations of cool things to do and nice walks to see some amazing architecture. They also have two hour walking tours of the city available on Tuesdays, Thursdays and Saturdays at 10.00am. If you’d like to explore Barcelona by bike, these are available for hire at the hotel. 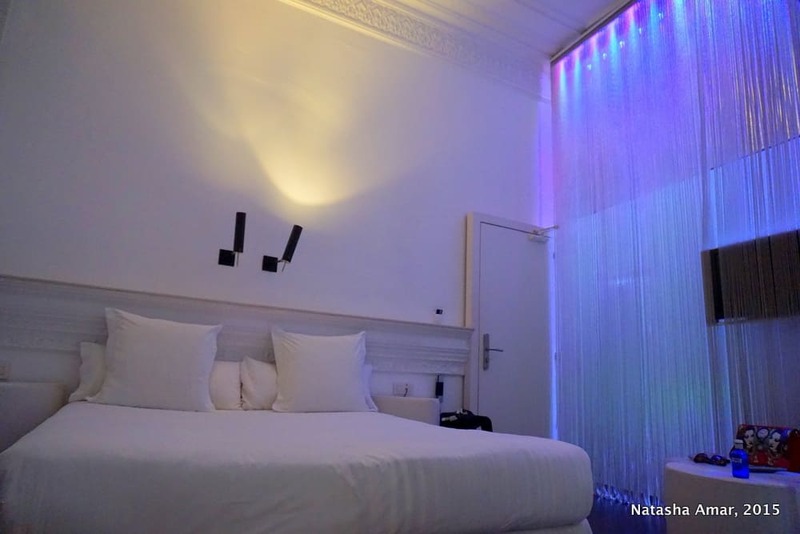 The chic&basic Born is perfect for independent minded travelers who’d like to stay in a value-for-money and unique hotel that looks and feels nothing like a standard (or boring) hotel, while being close to the city’s fantastic historical architecture, interesting neighborhoods and nightlife. 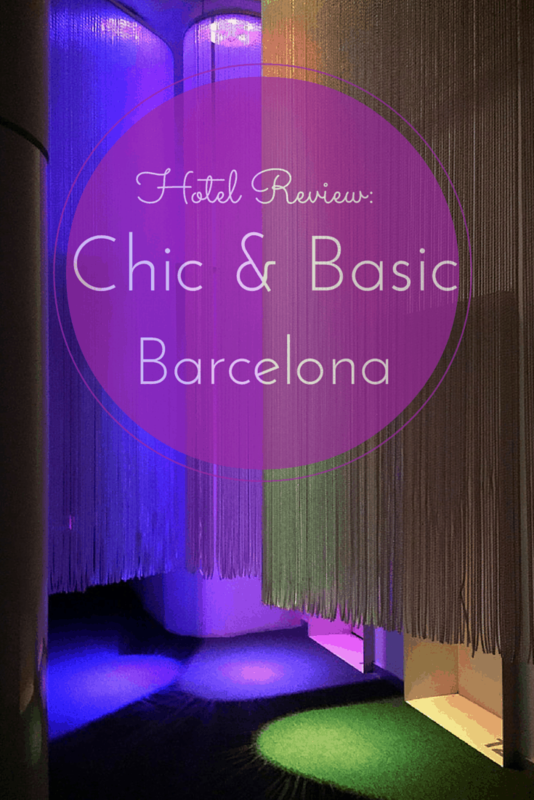 If you’re looking for a unique hotel experience in Barcelona, I highly recommend chic&basic Born- it’s great value for money, very stylish and original, located in the cool neighborhood of Born and great for independent travelers. ‘Chic&basic’ indeed! You can book with them on their hotel website chic&basic Born and also connect with them on Facebook, Twitter, Instagram and Youtube. They also offer apartments in the Born area and you can check those out on this website. 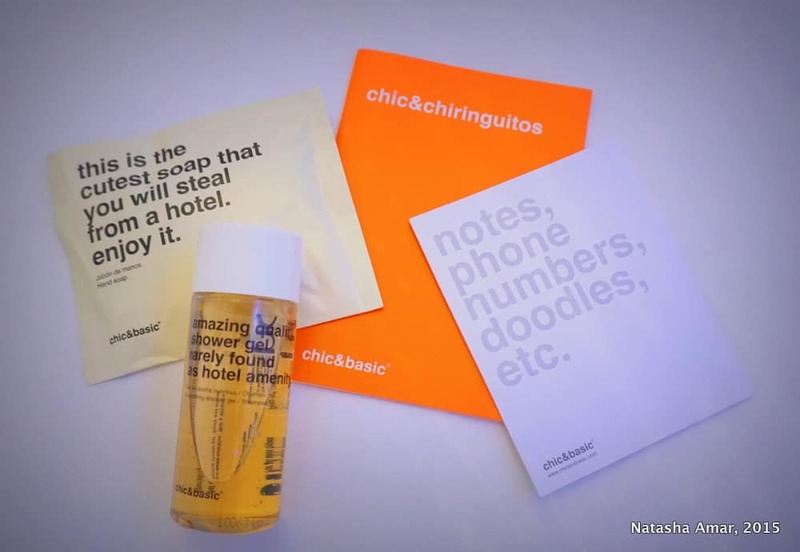 I was a guest of Chic&basic Born during my stay. All opinions, as always, are independent and my own.